Region: This insect is found in the eastern portion of the United States. Life cycle: This insect produces just one generation each year and overwinters as an egg. 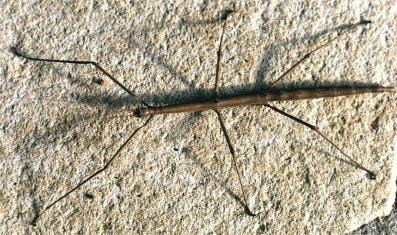 Physical Description: This 3-inch long insect is brown or dark green, very thin with a body like a stick, and can easily camouflage itself in trees and shrubs. Its eggs are black and are deposited on the ground. Feeding characteristics: The insect is common to the cherry tree and may feed extensively on the foliage, but damage is never serious. Controls: None required, damage is never serious.